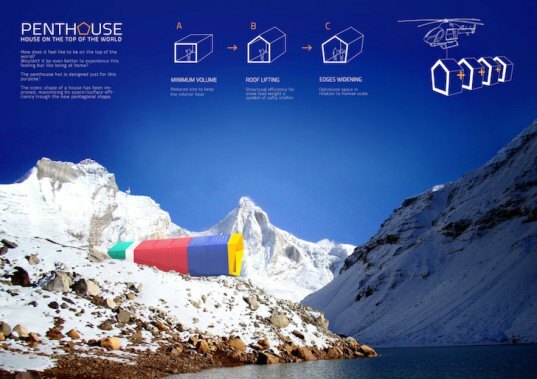 Homemade Dessert (HMMD) unveiled the winners of its Himalayan Mountain Hut competition—just five days after a 7.8-magnitude earthquake tragically struck Nepal two weeks ago. Mount Everest, a major focus of Nepal tourism, was hard hit by the recent earthquake, which triggered an avalanche that killed at least 10 climbers and guides, and trapped countless others. Although the timing is unfortunate, HMMD hopes that these winning design proposals could be used as inspiration in the Nepal rebuilding effort. 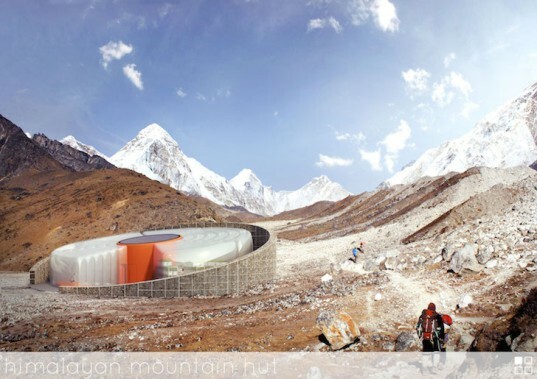 The international architecture competition explored designs for a Himalayan Mountain Hut that would provide safe and comfortable shelter for trekkers to Mount Everest and its surrounding peaks. Read on to see the three winning submissions. The design for ’Penthouse: House on the top of the world’ was crowned first place in the architecture competition. 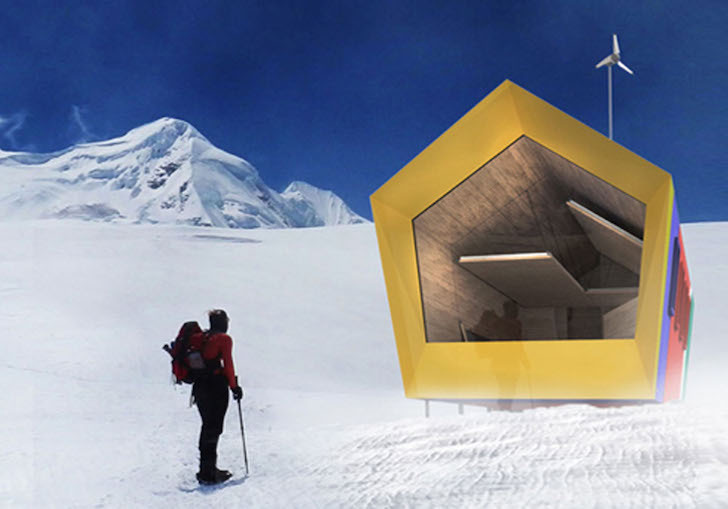 The design team, which comprised Davide Prioli, Dennj Avanzi, and Andrea Mancini, created a hut with a colorful modular framework to make it easily adaptable to different sites, altitudes, and number of occupants. The team created different prefabricated module ‘types’—from the window module to the toilet module—that can be snapped together to create a continuous space. The PVC-clad modules were envisioned with a timber framework and thick hard foam insulation walls. The self-sufficient hut would be powered by solar energy and collect and store rainwater for use. The ‘Shelter Bag’ proposal won second place. The avalanche-resistant design, created by Dorota Szlachcic, Mariusz Szlachcic, Julia Kisielewska, and Wojciech Klapcia, can be understood as a hybrid between the mountaineering sleeping bag and the tent. Designed to be constructed offsite using local labor and local materials, the Shelter Bag features a frame made from light carbon beams covered with a thermally insulating shell. An additional layer decorated with a Himalayan flag-inspired design wraps around the cocoon-like shelter and helps retain heat while allowing ventilation. Agata Dziemianczyk, Jedrzej Pawlaczyk, and Miroslaw Wojcieszak created the third place-winning design. The angled ellipse-shaped building is made up of three main sections: a solar panel-topped central service unit, the living spaces, and a gabion wall that wraps around the perimeter. Created for easy assembly and transport by helicopter, the shelter was also designed to respect local traditions and context. The solar-powered hut also features rainwater collection and storage, heat recovery ventilation, a heating system, air collection, lightweight ETFE pillows, and a greenhouse. The design for ’Penthouse: House on the top of the world’ was crowned first place in the architecture competition. The team created different prefabricated module ‘types’—from the window module to the toilet module—that can be snapped together to create a continuous space. The PVC-clad modules were envisioned with a timber framework and thick hard foam insulation walls. The self-sufficient hut would be powered by solar energy and collect and store rainwater for use. The ‘Shelter Bag’ proposal won second place. The avalanche-resistant design, created by Dorota Szlachcic, Mariusz Szlachcic, Julia Kisielewska, and Wojciech Klapcia, can be understood as a hybrid between the mountaineering sleeping bag and the tent. Designed to be constructed offsite using local labor and local materials, the Shelter Bag features a frame made from light carbon beams covered with a thermally insulating shell. 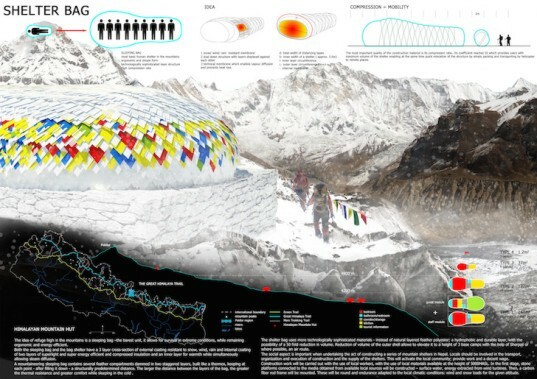 An additional layer decorated with a Himalayan flag-inspired design wraps around the cocoon-like shelter and helps retain heat while allowing ventilation. Agata Dziemianczyk, Jedrzej Pawlaczyk, and Miroslaw Wojcieszak created the third place-winning design. The angled ellipse-shaped building is made up of three main sections: a solar panel-topped central service unit, the living spaces, and a gabion wall that wraps around the perimeter. Created for easy assembly and transport by helicopter, the shelter was also designed to respect local traditions and context. The solar-powered hut also features rainwater collection and storage, heat recovery ventilation, a heating system, air collection, lightweight ETFE pillows, and a greenhouse.